A lifetime of excellent dental health can have a profound impact on the health of your entire body. That’s why it’s so important to start your child out on the right path - one that will make going to the dentist something they look forward to - and taking good care of their teeth something that comes naturally. From the day their first tooth arrives to the day they graduate from college, your kids will go through incredible change. That’s why the special care only available from a pediatric dentist is right for your child. It’s also why in Lancaster, CA and the Antelope Valley, kids love us, and parents trust us. There’s no better feeling than when a member of our extended family of patients refers someone to come and see us. We think that’s worth celebrating every time...so we’ve added an element of excitement to make it more fun. 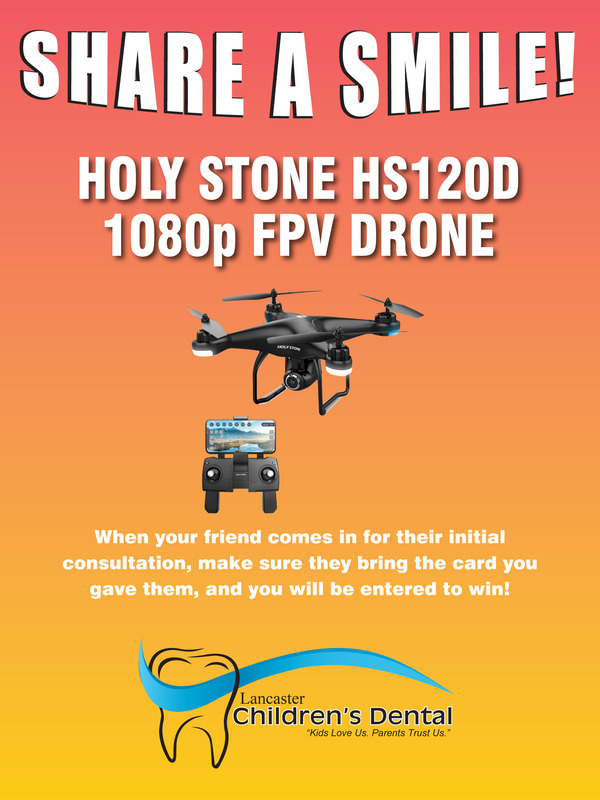 We are currently entering SHARE A SMILE referral cards into a drawing for a great prize! Download the card here, fill out your part, and share it with your friends. When they bring it in for their free consultation, the card will be entered into our drawing. Good luck and thank you for sharing a smile! CLICK HERE to learn more.